The Sewage Pollution Right to Know Law, which was passed in 2012 in New York State, gives the public the right to know when untreated or partially treated sewage is discharged from a public sewer system into New York waters, allowing the public to avoid unnecessary exposure to dangerous sewage pollution. Untreated and partially treated sewage discharges from public sewer systems may happen during a heavy rainstorm or significant snowmelt when storm water runoff enters the sewer system to a point where it overwhelms the capacity of the system and spills into the environment. Other reasons for a discharge include sewer system blockages, structural, mechanical or electrical failures, collapsed or broken sewer pipes, and vandalism. The older a sewer system is, the more likely it is to experience sewage discharges. New York State requires that a municipality make public notification within four hours of a sewage discharge. Notification happens via local news outlets and the website of the NY Department of Environmental Conservation (DEC). In addition, the DEC will produce a statewide Sewage Discharge Report each year that will report annual discharges and remedial responses taken. People interested in receiving these notifications can sign up with NY-Alert. It is free and you can enroll here: https://alert.ny.gov/enroll. You can choose how to receive the notifications, such as phone, email, text, or fax. You can also choose to receive other alerts related to weather, road closures, public health issues, missing children and other emergencies. Reducing the amount of water used in your home also reduces the volume of water in the public sewer system, thereby decreasing the potential for sewage overflows during storm events. The following steps will help – shut off faucets when not in use, repair leaking faucets or pipes, take shorter showers, install low flow faucets, showerheads and flush toilets, replace older dishwashers and washing machines with newer, water conserving models, and use rainwater to water your gardens by installing rain barrels. 2. 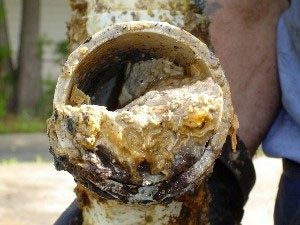 Don’t Dump Fats, Oil and Grease Down Drains. Diapers, moist wipes, and personal hygiene products that are commonly flushed down the toilet can damage or clog sewer systems and wastewater treatment equipment causing a sewage overflow. Do not flush any of these items, even when they are labeled as flushable. Throw them in the trash. For more information on the City of Auburn’s “Wipes Clog Pipes” public education campaign, please click here.